Want to keep your application as secure as possible? According to the last 10 years of Rubysec data, the most secure, actionable strategy is to keep your dependencies on the bleeding edge. I’ve heard arguments made for all three of the above. Let’s confront them with the data. Thanks to the fine folk at Rubysec we can do better than just arguing about the security of the above strategies. The Ruby Advisory Database gives us 10 years worth of Ruby vulnerability disclosure data. Combining that with the Rubygems API for gem versions gives us all the data we need to test each strategy’s security profile. Combining the above with Rubysec’s advisories database and Rubygems’ versions API, we’ve got everything we need. We've open-sourced the code to replicate all of the results below. The code is heavily commented, so anybody should be able to follow along. The repo contains full setup instructions and a Dockerfile to make it easy to get up and running. If you want to experiment with the data, we'd love to hear what you find. First up, let’s quickly talk about that 47% “no fix” number. Nearly half the dependency vulnerabilities considered didn’t have a patched or unaffected version available on the day of disclosure. Ouch. A bit more digging shows that number falling to 32% a month after disclosure, and eventually as low as 21%. Almost all the affected dependencies are unmaintained, which goes a long way to explaining it. The “always up-to-date” and “late adopter” strategies perform almost identically---the “always up-to-date” strategy is marginally less likely to be affected by a new vulnerability, but with only a small data set they’re statistically inseparable. However, consider the ease with which an “always up-to-date” user can apply a new security patch on day zero, which is almost always the required response. The delta in that patch will likely only contain the security change, whereas the “late adopter” often has to upgrade a major or minor version (or backport the patch themselves). 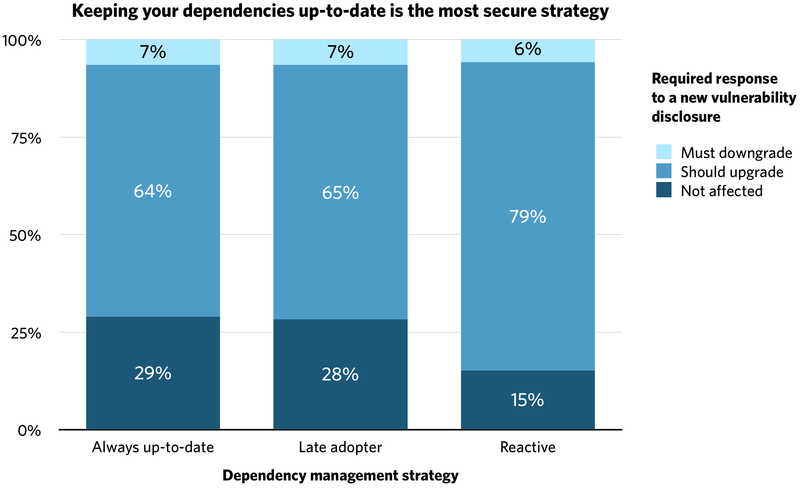 Put another way, if your dependencies are totally up-to-date you’re just as secure as someone pursuing a late adopter strategy, but have the additional advantage that you can respond to new disclosures more easily. Finally, it's surprising to see the “reactive” strategy perform so badly. It’s twice as likely to be vulnerable as the “always up-to-date” strategy, and the “fix by upgrading” flow is likely to be just as difficult as for the “late adopter”. Nice data, so what should I do about it? I’m so glad you asked. As luck would have it, we’ve spent the last few months building Dependabot. It’ll make keeping your dependencies up-to-date a breeze, and by extension help you keep your app secure.